Hey and happy Friday! 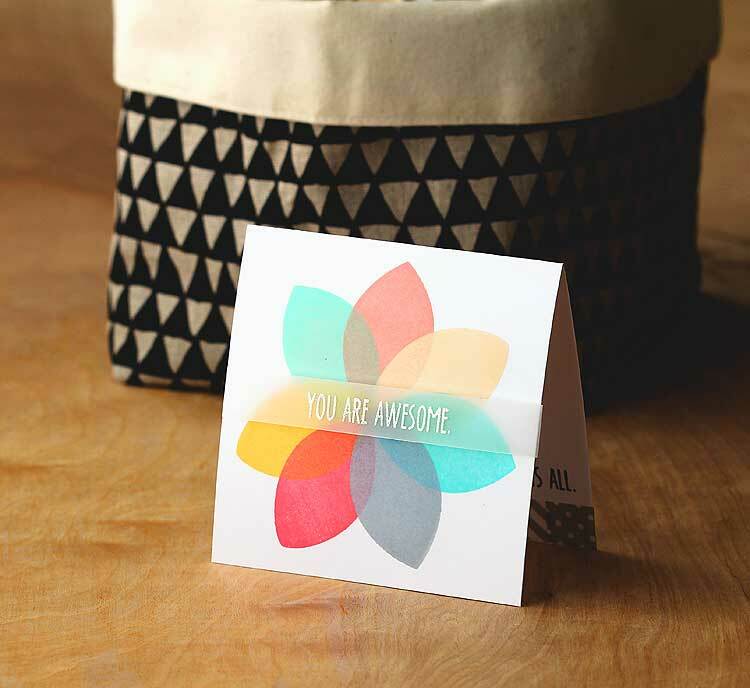 I’m honored to be the March guest designer at Neat & Tangled, and I’ve got another card to share. Neat & Tangled Stamps + Overlapping Inks = Neat Effects. Today I decided to put that petal shape to work and make a flower. You can get some really neat effects by overlapping your inks! I didn’t have any problems at all switching from one color to the next either — I just cleaned the stamp off with a baby wipe in between colors and that was that. 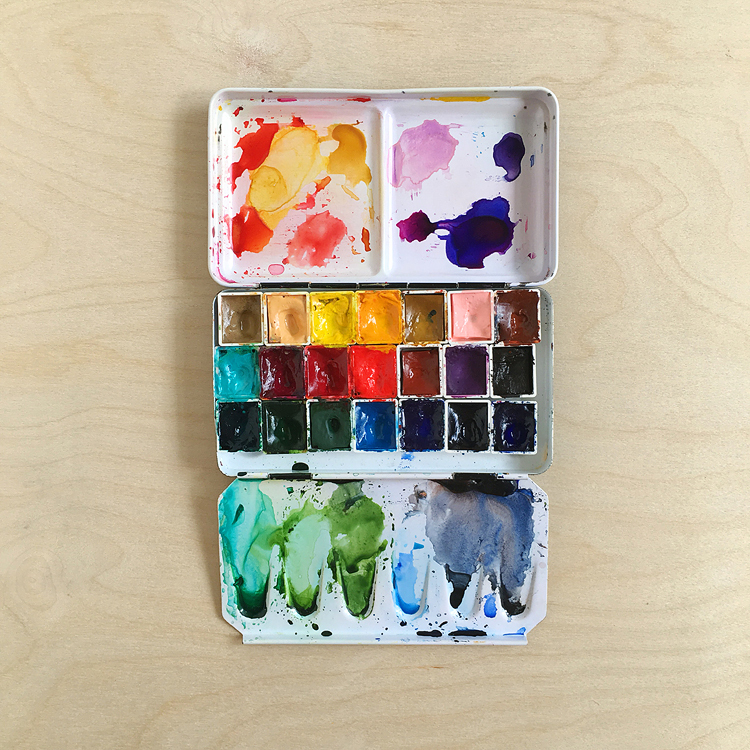 Color me happy! And very very impressed. So here’s my trick for doing this if you’d like to try yourself. My secret weapon? A pencil! 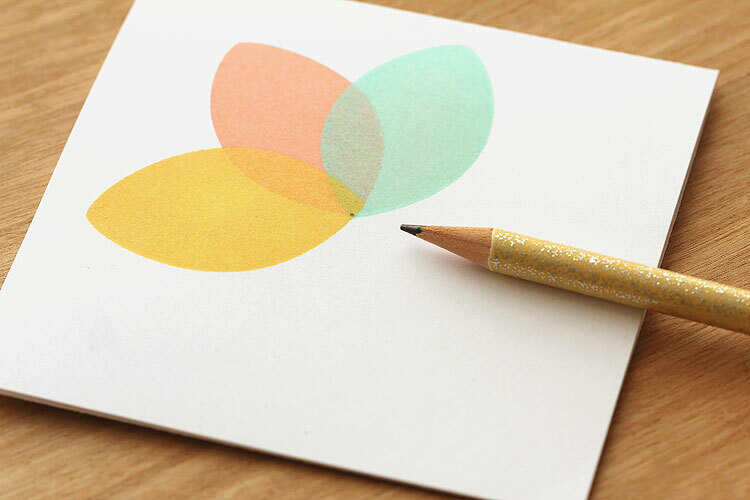 Just start out by making a dot in the center of your card, then line up the point of the petal with the dot and stamp the petal, overlapping as you go. 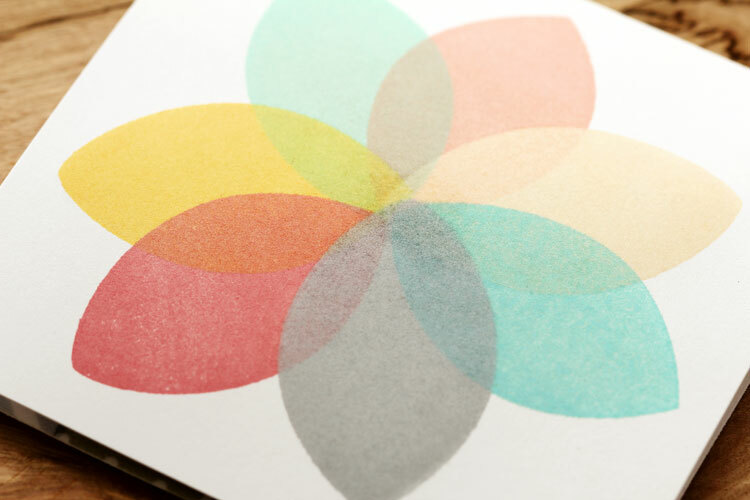 When the inks overlap they will form a new color — too cool! It was hard to capture how neat it looks — it’s kind of like a velvety suede finish. Wah! I had to throw that soft granite in there after noticing how some of the other colors like the mint julep and soft cantaloupe combined to make a gray. I haven’t tried this with other inks, but I bet you’ll get different effects depending on what ones you work and I would guess that dye inks would work best for this instead of pigment. I think I’ll have to experiment and see! After I was done I just couldn’t bear to cover up the front of the card, but I still wanted to add a message. 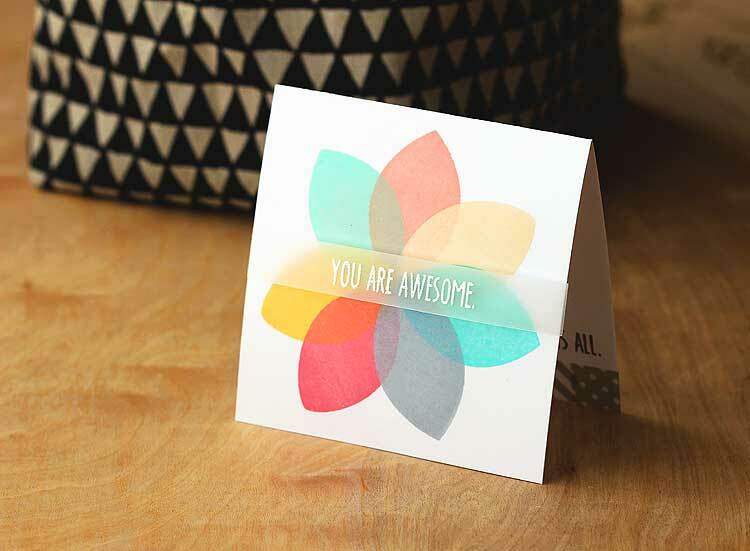 So I stamped “you are awesome” on vellum instead and heat embossed it with white embossing powder. Then I decided to stamp the “that is all” message on the inside with charcoal ink — after adding a little washi. Those two messages are just too clever together! I plan to make some more of these in different colors — plus I have big plans to get my math geek on and make some Venn diagram cards to give to J with this set too! Cannot wait. 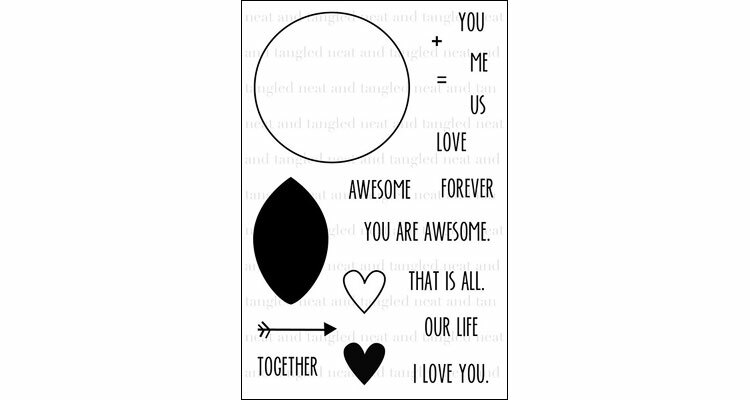 If you’d like to pick up a You + Me set of your own, they are available here at Simon Says Stamp, or you can sign up to be notified when they are back in stock the Neat & Tangled shop here. There are more awesome stamps in the shop too — I’ve got my eye on this Diamonds 3×4 stamp — perfect for journaling cards. Told ya that Danielle was clever! Shadow ink + watercolor technique. 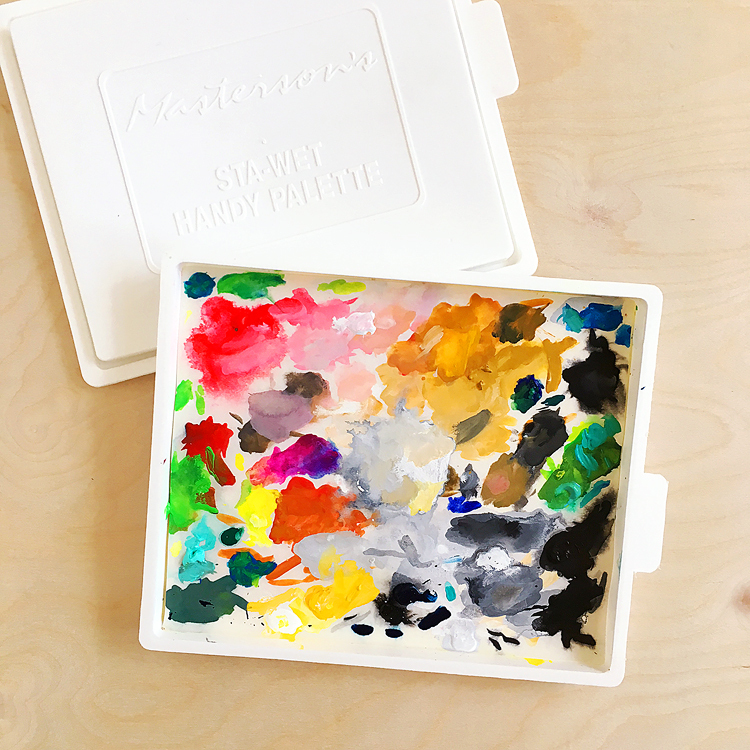 Hero Arts summer release sneak peeks + workshops! You are awesome. This card is awesome. These inks overlapping are awesome. That is all. Wow! This card is gorgeous!!!! The colors work SO WELL together! And I love how soft they look! Swoon!! And then the inside of your card is amazing!!!! I love love love the strips of washi!!!!! So simple yet so stunning and effective! I ADORE this!! You rock, Lisa! Great idea and effect! I love the vellum sentiment strip, too! TFS! 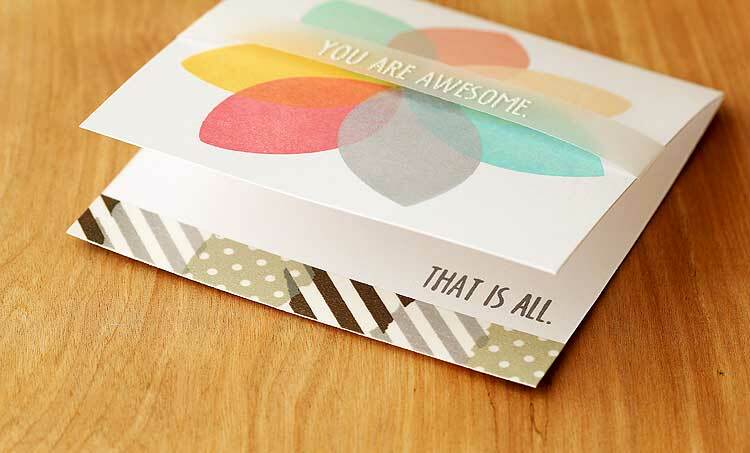 A great job on a fun, colorful, happy card. I like the vellum sentiment to let the colors show! Dotty Jo recently posted..Happy, happy! Totally amazing! Or should I say “totes adorbs”?